Casino Joy Review - #1 Trusted Evaluation - Is Casino Joy Legit? Throughout our job of reviewing casino sites, we so often state that first the impression is an important factor in our decision to review such a site. This can certainly be said about Casino Joy. A good first impression is putting it mildly. Upon accessing the site, you are greeted with attractive images and a clean interface. Combine that with a neat navigation and layout, and you are instantly transported into a fine casino environment. There are over 1300 games on offer to keep even the most fickle player happy. Read on throughout our Casino Joy Review to see what this casino has to offer you. Licensing – Is Casino Joy Legitimate? First things first, this the number one attribute we look at. 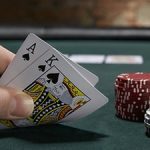 Is the casino safe and legitimate to play without any form of concern about deposits, play and withdrawals? We can confirm that Casino Joy is a sister site of Genesis Casino. 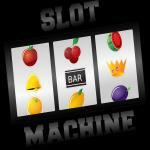 They are owned and operated by the same team that brings us this fine online casino. This is good news because we are an avid player at Genesis, and knowing you are in good hands makes the play extra comfortable. Casino Joy, under the name of Genesis Global Limited, they are incorporated under the laws of Malta and are regulated under the Malta Gaming Authority. Much like our Genesis Casino Review, we will guide you through the best and worst in our Casino Joy review. Accepted countries at Casino Joy? However, there are a few notable restricted countries. These are the likes of Australia, United States of America, France, Italy, Belgium and Spain. Full list of restricted countries are displayed in our summary above. The software available at an online casino plays an important role in our reviews. This determines not only the quantity of games, but also the quality of gaming. Casino Joy utilizes the use of several software operators to be able to offer a very handsome game library to their players. 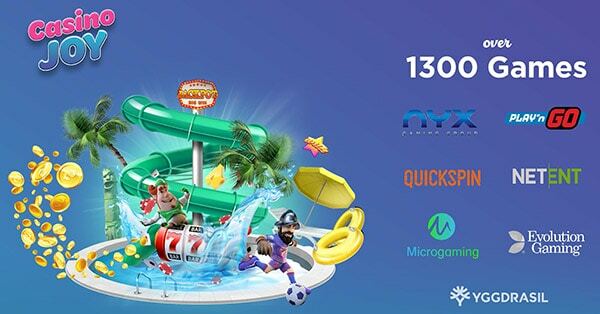 The providers come from NYX Gaming, Play’n’Go, Quickspin, Net Entertainment, Yggdrasil, Microgaming and Evolution Gaming. This is great news meaning we have numerous games to choose from. Over 1300 games in fact. However, when it comes to multiple software operators being in operation, there are often some country restrictions enforced. These come from the software company themselves. Just like a casino has restricted countries, so do the software operators themselves. Most notable are that Canada are restricted from playing any Net Entertainment and NYX games, and the UK are restricted from playing Lucky Streak games.  Players from the Netherlands are not able to play both Microgaming and Evolution Gaming titles. The casino is Geo targeted, so upon registration, all available games will be visible to you in your jurisdiction. Due to the fact that Casino Joy has over 1300 games to offer their players, it is not possible to name each and every one. Well we could but this would take up an awful lot of space. This is a good problem though because no one wants to get bored of choice. Of course, all the most common table games often go without saying, but the slot titles usually make up the bulk of the games on offer. Therefore, our Casino Joy review will summarize into the usual common categories and highlight what this casino has to offer you the player. 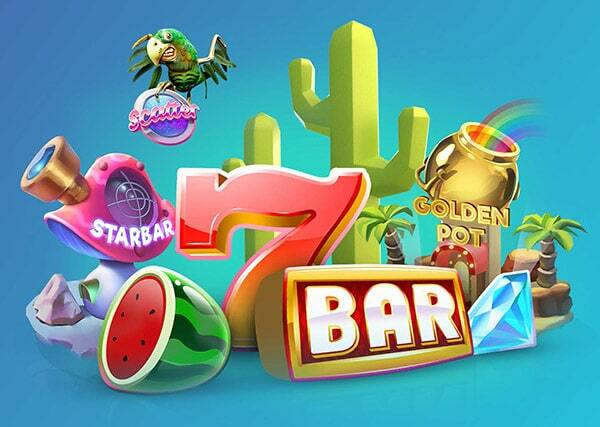 There are a vast selection of slot games available at Casino Joy. Powered by top software providers like Microgaming, Net Ent and Play’n’Go, there is no shortage of choice. Top titles include the likes of Halloween, based on the 1978 movie, Book of Dead, Rainbow Jackpots and the massive millionaire maker slot, Mega Moolah. Worth a mention include Jurassic Park, Jurassic World and Phantom of the Opera for those movie goers among you. Other lesser know titles consist of Dragon’s Luck, Lucky Valentine and Golden Fish Tank. We feel the need to highlight the big jackpots on offer at Casino Joy. We have already mentioned that the millionaire maker slot Mega Moolah is available to play, but lets list some others that will always be of interest. There is King Cashalot with jackpots that can stretch into the hundreds of thousands. Currently, Gunslinger: Reloaded is approaching 60k and Major Millions 5 Reel is often around the half million mark. Several options for the player that feels lucky to strike it rich. Continuing on through the games brings us to the table game options which will be found under the ‘Casino Games’ tab. From there you can select ‘All Games’, ‘Roulette’, ‘Blackjack’ and ‘Other Games’. It is clear that both Roulette and Blackjack have their own category, so you will find multiple versions of both these games upon clicking. 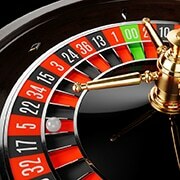 Roulette versions include French, American and European Roulette, Premier Roulette and Multiplayer Roulette. Under ‘Blackjack’ you will find no fewer than 24 versions of this classic popular table game. To name some would be High Limit European Blackjack, Spanish 21, Single Deck, Vegas Strip, HiLo13 Gold, Multi-Hand and Double Exposure Blackjack. From the ‘Games tab’, you will come across Casino Hold’Em, Gold and regular Baccarat, Triple Pocket Poker, Cyber Stud Poker and Poker Pursuit. Staying under the ‘Other Games’ category and we find multiple versions of video poker. This is great as it is such a popular game. If you have every visited a land casino you will have likely noticed that you will not only find numerous video poker machines in their very own section of the casino, you will also see these at the bar when you go to get a drink. At Casino Joy you can play Deuces Wild, Jacks or Better, Aces and Faces Poker Power, Joker Poker and Bonus Poker. We can add to this Tens or Better, All Aces and Double Double Poker. a great selection for the video poker player. This ‘Other Games’ category not only houses the table games and video poker already mentioned, but you will also find several arcade style games and the widely known casino game, Keno. Playing here you can expect to find arcade games by the name of Max Damage and the Alien attack, Crypt Crusade Gold, Halloweenies, Dawn of the Bread and Space Evaders. Scrolling down further and we see bingo Bonanza, Bunny Boiler, Dragons Fortune, Beerfest and Bubble Bonanza among others. You can even play Virtual Horse Racing and Monkey Keno here. Overall, our Casino Joy review of the games highlights what you can expect and there is clearly a vast game choice for players. It goes without saying that the most realistic casino experience when playing at home, is to play your favourite table games with live dealers. This of course applies to the table game enthusiast, but if you are one of these casino players then you will understand the difference. Playing with a live dealer adds something real to the game that you cannot get with the video version. Well rest assured, Casino Joy houses one of the finest live casinos onlineXXX. We find no fewer than 76 live dealer casino games to enjoy. Among these are a multitude of table lobby’s and variations of all the classic table games. Try your hand at a live blackjack game using a winning blackjack system. Play some Caribbean Stud Poker, spin the Dream Catcher Wheel, take in some Texas Hold’Em, or cheer the roulette ball into a pocket using our roulette tips and advice. There really is some vast excitement to be had at the Casino Joy live tables. First Deposit gets a 100% match up to $200. 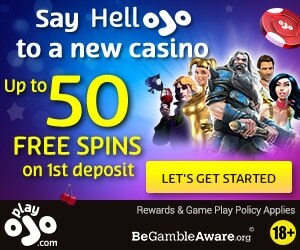 Second deposit gets a 50% match up to $200 using bonus code WJOY2. Third deposit gets a 25% match up to $300 using bonus code WJOY3. 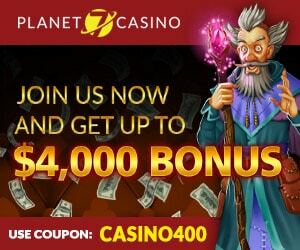 And likewise, your fourth deposit also gets a 25% match up to $300, this time using bonus code WJOY4. This clearly shows that if you are the type of player that goes looking for the bonus, then you also need to be a slot player. Otherwise it will take you forever to achieve the playthrough by playing a table game. However, these requirements are normal and need to be expected. If this doesn’t suit you, then simply do not accept the bonus and play with your own money only. If you are a player from the UK, then you can expect a slightly different bonus. 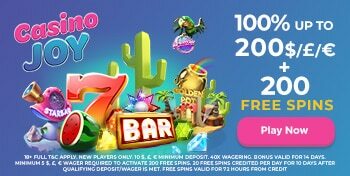 As a player from the United Kingdom, you can get a 100% welcome bonus of up to £200 + 200 Free Spins on the slot Starburst. The same wagering requirement applies. So, any winnings from your free spins will need to be wagered 40x before you can withdraw or transfer to real money. Our Casino Joy review has not allowed us to view further offers currently. They seem to be random gifts given upon depositing at various times of the week. For example, they have an offer called “A Freebie to start the weekend”. This means to say that if you deposit and play through the week, you will automatically get a gift in your account to enjoy from Thursday to Sunday. They do not specify exactly what the gift will be, so we can only assume that it will come down to how heavy your game play is. The VIP Program at Casino Joy deserves a mention in our review. You do not need to be a big time high roller or deposit huge sums of money here to earn rewards here. Regular players will benefit from their online casino VIP program and your loyalty will not go unnoticed. If you are a frequent and loyal player at Casino Joy you can expect to receive several benefits to go with your play. This can include a dedicated account manager, exclusive bonuses and promotions, monthly VIP prize draws, holiday packages and a personal withdrawal service. This is excellent and clearly shows that they take care of their players. If you want to play at an online casino for real money, then you need to be able to deposit and withdraw your money using a method that suits you and is available to you. Thankfully, Casino Joy offers quite a few banking options that should benefit most players. We list all deposit and withdrawal options in our summary table above. Therefore, we will summarize what is available to you here, because some cashier methods are not available to all countries. Talking of methods for certain countries, Casino Joy is Geo targeted. This means that when you sign up and login, you will only see what is available to you in your country. 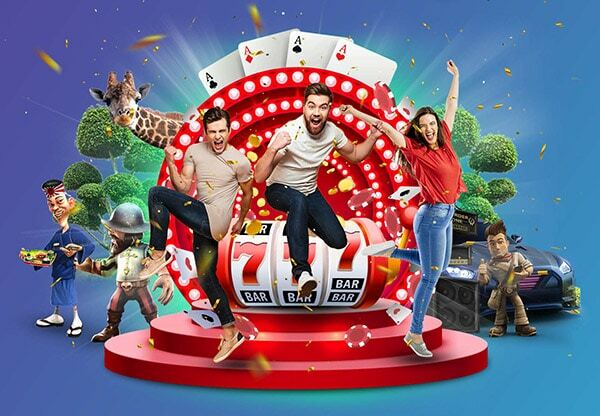 If you are a player from the United Kingdom and are looking for a top UK online casino, then you will be able to deposit using the following methods: Visa, Visa Debit, Mastercard, Maestro, boku, entropay, trustly and and popular e-wallets Skrill and Neteller. Players from Canada will be suited by having the option of using Interac e-transfer and Instadebit. These options make it very easy for the Canadian player. You can also use iDebit, ecoPayz, paysafecard, Visa and Mastercard. The e-wallet options Skrill and Neteller are not available to Canada players unfortunately. All deposits are processed instantly, meaning the funds will be available in you account as soon as you click the button, assuming you have the funds available in your chosen method of course. Many withdrawal options are considered an instant transaction and this depends on banking method. For example, e-wallet options like ecoPayz, Skrill and Neteller are instant withdrawals from the casino. Whereas methods like credit card can take 1-3 business days. Interac, Instadebit and Bank Transfer come with a 3-5 day processing time. We are satisfied with the banking area at Casino Joy. We have seen more options at other casinos, but we have also seen a lot less. A good variety that will suit the majority of players wishing to fund their account. How can you access Casino Joy platform? At the time of writing this review, there is no download client available at Casino Joy. This is often the trend with new online casinos, and with the ever increasing speeds of the internet, it is often not needed. Playing online in instant flash play is the way many new casinos are going. This is fine though because you can access Casino Joy through your desktop computer, or by laptop and tablet. You can also play on the go with your mobile device, whether is be Android or IOS. It is worth noting that although Casino Joy offers over 1300+ games, there is about 500 games available via mobile play. This is mostly due to the software providers of the games only offering desktop play, but the casino can certainly be accessed on your cell phone quite easily. We would also like to say that it is a very responsive design, so we have no problems playing on a mobile. Support is good and you should feel comfortable in the knowledge that help is not far away if you need it. Casino Joy support can be reached via telephone, email and live chat. There is a contact link on the site that will have the telephone number associated with your country. They also are available through social media with links to Facebook, Twitter, Instagram and YouTube. To bring everything to a close and conclude our Casino Joy review, we feel confident that this casino is worth a place among out top choice casinos. They have a very attractive layout, easy on the eye design and clear navigation. Couple this with the vast selection of casino games across several top software providers make them a true force in online gaming. Hopefully our review has helped you decide whether this casino has what you are looking for. Have fun!